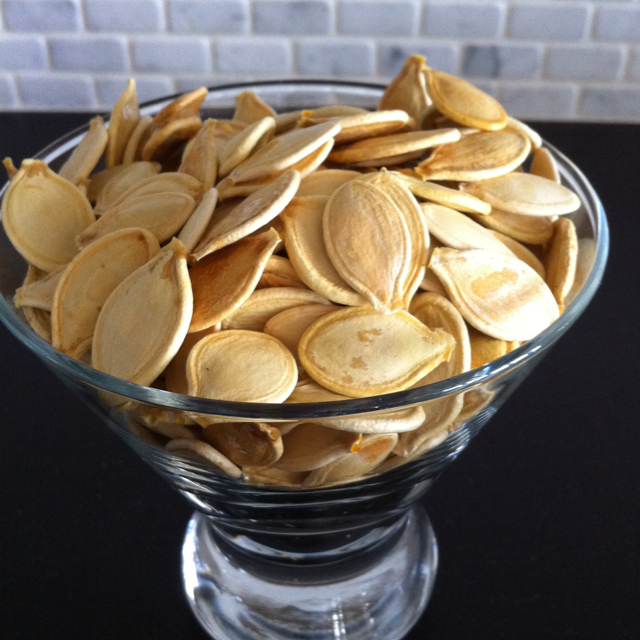 These pumpkin seeds are a delicious treat to make after carving the pumpkin. Scoop out the seeds and pulp from a pumpkin, and separate the pulp from the seeds, discarding the pulp. Rinse the seeds in a large colander under cold running water, removing any remaining clinging strings. Seeds will feel slippery to the touch under the water. Dump seeds, a small amount at a time, into paper toweling and dry. Spread onto a large baking sheet and allow to finish air-drying for an hour or so. When seeds are dry, toss them with the vegetable oil to coat well and sprinkle liberally with salt. Spread into a thin layer on the baking sheet and place in a 325 F oven for 18-25 minutes, or until golden brown, stirring every few minutes to prevent burning. (These little suckers taste so good that roasted seeds rarely are allowed to cool much beyond just cool enough to touch before they get scarfed. ).